Simply stunning. 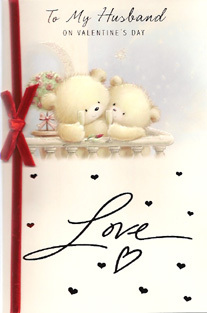 Such a cute card, encapsulating the true meaning of Valentine's Day - Love. A teddy bear couple on a romantic balcony enjoying a glass of bubbly. A velvet bow adds the perfect finishing touch to this magnificent card.